We’re developing quite a love of our local greengrocers in the Little Birdie household. I’ve read before that having a local greengrocers can help raise the price of your house if you’re selling it and this would appear to be true as a house round the corner is currently on the market and our local independent greengrocers is mentioned in the sales details! At this time of year berries are plentiful and cheap. Last weekend they had 2kg boxes of cherries for £3. 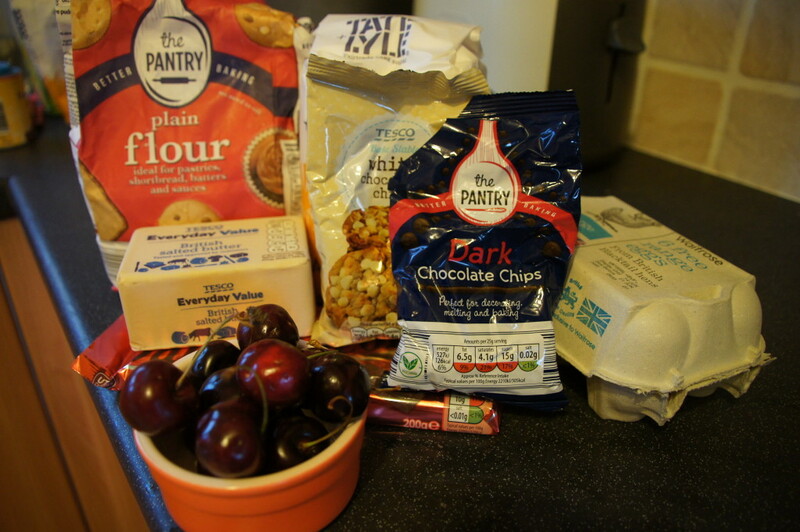 We bought one but knew we would struggle to eat them all so I decided to put some of them to use in some baking. I knew I’d seen this John Whaite recipe last year so I decided to give it a go. You are supposedly able to de-stone a cherry by using a paperclip and unbending it to leave the hook shaped part as a hook. You then insert that hook up into the base of a cherry, feel the way around the stone and then gently manipulate out the stone, being careful not to squash the cherry or remove too much flesh. I really struggled with this and ended up using a knife to cut them out (which still worked). 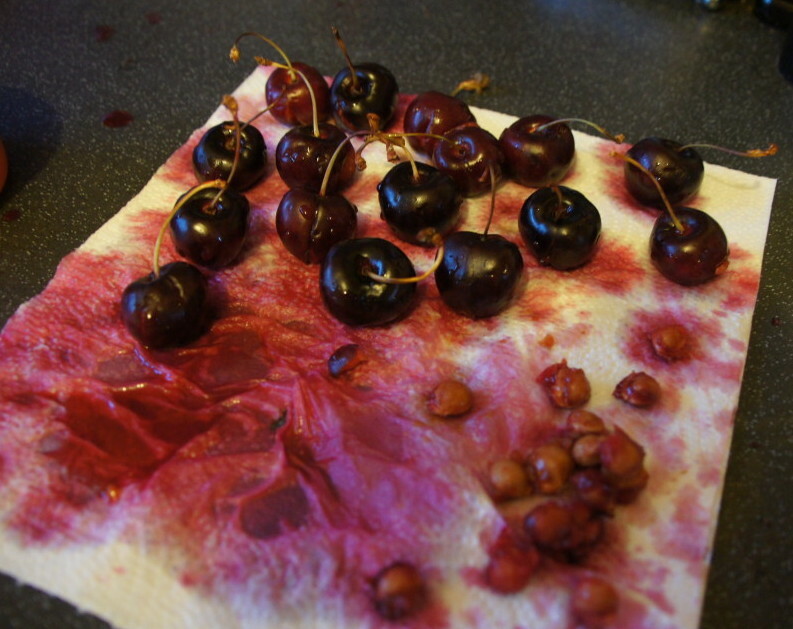 After you have pitted your cherries, place them wound side down onto a paper towel. 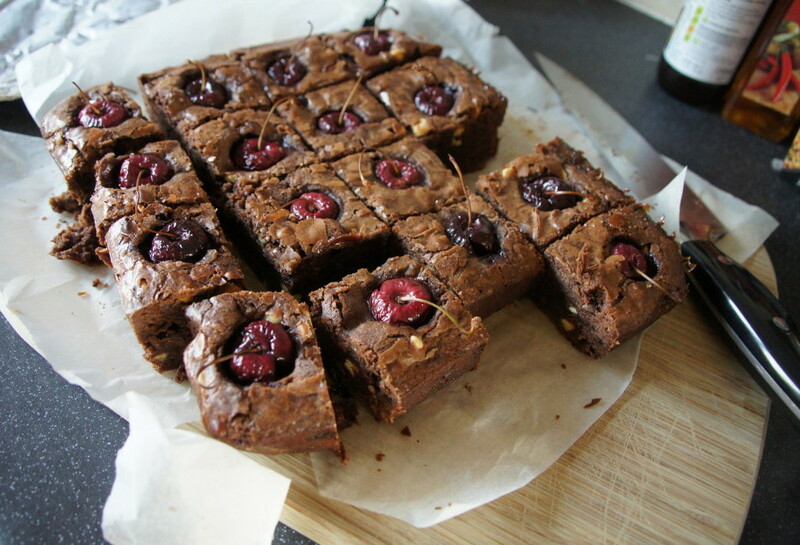 This recipe will make 16 brownies. You will need a 20cm square tin and a large saucepan to mix everything together. I ended up pouring my mixture into a large bowl as it wouldn’t all fit in the saucepan. 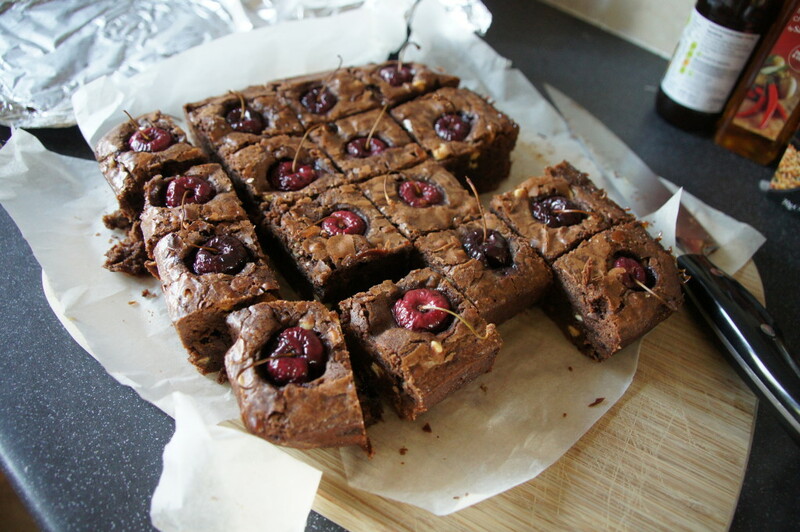 These brownies have a gooey texture (as any good brownie should) and were a big hit all round. 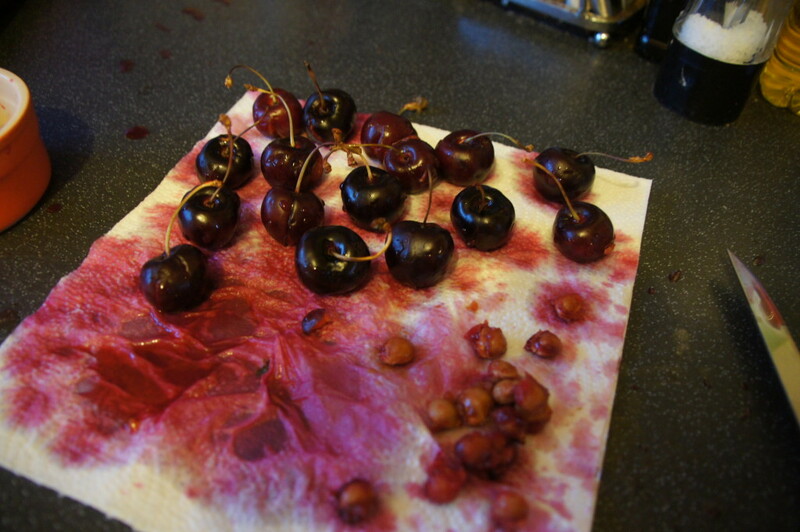 1) Begin by pitting your cherries. 2) Preheat the oven to 200C/180C fan. Grease and line a 20cm square cake tin. 3) Place the chocolate and butter into a saucepan and set over a low heat. Stirring constantly, melt them together until very smooth and shiny. Remove from the heat and add the eggs and beat in until smooth, then beat in the sugar until it is more or less dissolved. 4) Sift over the flour and fold in along with the chocolate chips until you have an evenly smooth batter. Pour the batter into the prepared tin and bake for 15 minutes. 5) Remove from the oven and press the cherries into the mixture as evenly spaced as possible, leaving their tops and stalks poking out. Return to the oven and bake for a final 10 minutes. 5) When ready, the brownies should be a cracked, paler brown on top, and dark brown, dense and gooey underneath. 6) Allow to cool until completely cold, then chill in the fridge before cutting – this just helps to achieve an even, neater cut.